Outdoor flag signs are very critical for businesses and store fronts. 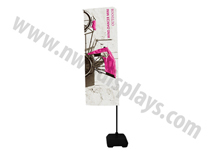 Well designed flags can grab attention to promote new specials or business locations. 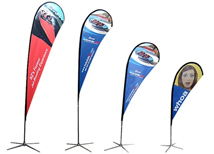 All of flags are printed in DIGITAL FULL COLOR and we never charge set up fees or extra for additional colors. Additional bases are available for indoor and outdoor use. We offer a variety of shapes and sizes in single and double sided that are sure to get maximum attention. Feather and tear drop banners continue to be the most popular shapes, but others like the Mamba and straight feather are gaining popularity. Most of our flags are available in 3 business days and can ship from multiple facilities in the US! 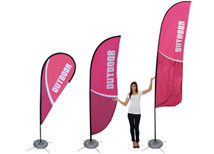 We offer a variety of options when it comes to outdoor flags. The Wind Dancer and Mamba are some of our most popular portable flag poles. 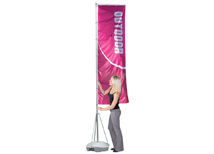 They can hold banners or actual flags for events and are portable and easy to move around. 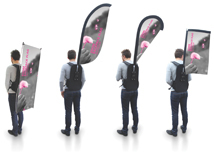 These are ideal for marathons, sporting events, races, and festivals where signs are needed to show specific areas. 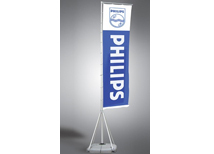 With optional heights up to 23 feet, these flags can be seen from almost any location at an event. 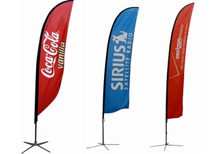 The Zoom brand of outdoor flags is our recommended product line because of the quality and available options. There is a drive over base that works great for auto shows or dealership advertising and an auger base that is great for securing flags in the ground. 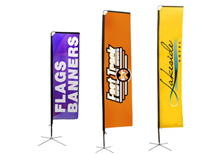 Our Mamba flags are a straight forward rectangle design that offer maximum branding space. All flags are printed with full color so advertising can easily match store front signage and other marketing materials!